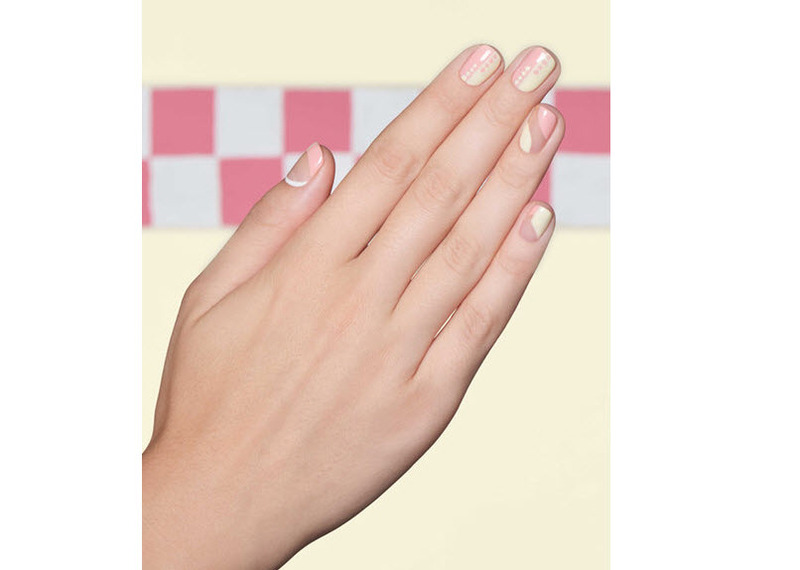 Apply 1 coat of OPI GelColor Base Coat to properly prepped nails. Cure 30 seconds in OPI Dual Cure Light. 1. Use a detailing brush, apply 2 coats of OPI GelColor Meet A Boy Cute As Can Be to the left half of the nail. 2. Cure each coat 30 seconds in Dual Cure Light. 3. Using a detailing brush, apply 2 coats of OPI GelColor Hopelessly Devoted to OPI to the right half of the nail. 4. With a dotter tool and OPI GelColor Meet A Boy Cute As Can Be, apply 4 dots to the left side of the nail, closest to the free edge. 5. Flash cure 15 seconds in OPI Dual Cure Light. 6. With a dotter tool and OPI GelColor Hopelessly Devoted to OPI, apply 4 dots to the right side of nail closest to the cuticle area. 7. Flash cure 15 seconds in Dual Cure Light. Nail Art Tutorial: "I'll Have A Pink Lady"